You don’t have to be a master electrician to own a home, but every homeowner should know the basics about how the electrical system in their house works and what to do when it doesn’t. Whether you plan on tackling electrical wiring problems around your house or prefer to leave them to the pros, resetting tripped circuit breakers and replacing burned out fuses is something every homeowner needs to know how to do. An electrical service panel is a metal box mounted on a wall or on the outside of your house which contains either circuit breakers or fuses to control the wiring in your home. The panel may also include a main breaker or main fuse to turn off all the circuits controlled by the panel. If not, the main for the house may be located at the electrical meter or elsewhere in your home. 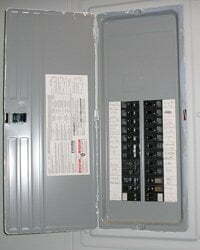 The purpose of circuit breakers and fuses is to limit the amount of electricity (expressed in amperes or “amps”) allowed to flow through the wires of an electrical circuit to prevent fires and electrical shocks. The maximum number of amps allowed before the breaker trips or the fuse blows is printed on the breaker or fuse, and usually ranges between 15 and 30 amps for standard 110-volt circuits. Make sure you are dry and standing on a dry surface before working on an electrical service panel or doing any other electrical work.